Will there be animal costumes in the daily deals anytime soon? I want to see in daily deals personal portal to Tera ver. '15 and earlier. 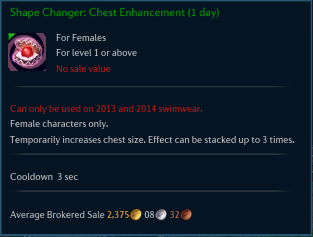 @KitTeaCup how about "items we don't want to see in the daily deals" ? Sushi cat account mounts. Specifically Saltyko. You can get the permanent version of that on the fashion coupon store, though, so not sure if the 1-day version is useful for anything. Oh... lol. Well could probably just put that on an in-game merchant rather than deals though. 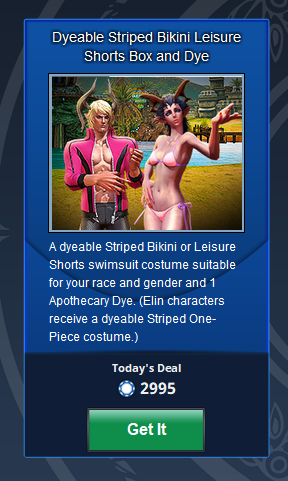 The image and text you used with the latest daily deal is not the same. Pic related is Peachstringer not striped swimsuit.